"There – thought for a moment it had vanished." The reader knows from the beginning that the orchard hive is on an old, out-of-business farm being sold, to be demolished so its land can be added to a light-industrial complex. But the bees in the old wooden beehive don’t know it. Bees are controlled so much by instinct that it is very difficult to realistically anthropomorphize them. But it has been done, in A Hive for the Honeybee by Soinbhe Lally (original Irish edition, February 1996; U.S. edition, March 1999), and the award-winning 1998-1999 five-issue comic book Clan Apis by Dr. Jay Hosler, a neurobiologist specializing in the study of honeybees, collected into a 158-page graphic novel in January 2000. 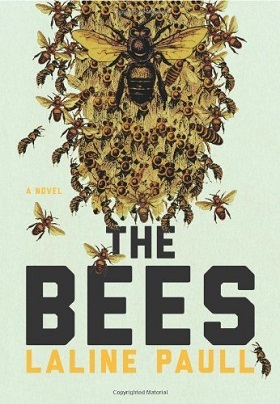 And now there is Laline Paull’s complex dystopian The Bees. Front., bee illustrations from Meyers Konversations-Lexikon 1897, NYC, HarperCollinsPress/Ecco, May 2014, hardcover $25.99 (340 pages), Kindle $12.74. "Halt!" Harsh voices reverberated from both ends of the corridor and a strong astringent scent rose in the air. Every bee stopped moving except the young female, who stumbled and fell across Flora’s pile of debris. Then she clawed her way into the remains of the broken cell and huddled in the corner, her little hands up. "You fled inspection." One of them pulled at the girl’s wings so another could examine the four still-wet membranes. The edge of one was shriveled. "Spare me," she cried. "I will not fly; I will serve in any other way -"
"Deformity is evil. Deformity is not permitted." "You." Their peculiar rasping voice addressed Flora. She did not know which one spoke, so she stared at the black hooks on the backs of their legs. "Hold still." Long black calipers slid from their gauntlets and they measured her height. "Excessive variation. Abnormal." "That will be all, officers." At the kind voice and fragrant smell, the police released Flora. They bowed to a tall and well-groomed bee with a beautiful face. "Sister Sage. This one is obscenely ugly." "It would appear so. Thank you officers, you may go." "Come, Sister. Unburden yourself." Sister Sage was calm and kind, and Sister Teasel dared look up. But there is one difference that cannot be permitted. When Flora feels the urge to produce fertile eggs after her meeting with the hive’s drones, breaking the commandment that only the Queen may bring future life to the hive, she knows that she must lay them and mix them in with the royal brood in secrecy lest she be torn apart. This becomes harder and harder as her larvae are discovered. A wave of masking scent rolled into the Fanning Hall at the arrival of a police squad. Every sister working there looked up in disapproval, for despite the vigorous activity it was still a sacred place. Flora recognized the particularly harsh scent of Sister Inspector and watched her speaking quietly with Sister Sage. Very slowly she averted her antennae, lest her notice rouse their attention. The priestess turned. Flora’s personal championship of her child becomes submerged within the apocalyptic chaos of the death of the old Queen, the ritual fight for supremacy of two princesses to become the new Queen, a civil war between two worker castes, and more. The Bees is an anthropomorphic fantasy based on realistic bee behavior, and, as is well-known, realistic nature ain’t pretty. Find out for yourself whether there is a happy ending or not. Ecco is today an imprint of publishing giant HarperCollinsPress. It was founded in 1971 as Ecco Press by Daniel Halpern as an independent publishing company. HCP acquired it in 1999, with Halpern continuing as its editor. The cover and frontispiece of “The Bees” are illustrations from 19th-century books on beekeeping.